Shakespeare Stage returns to the Center for the Arts at 33 Hawley to present Twelfth Night (Or What You Will), November 30 and December 1 at 7:30pm, and December 2 at 6:30pm. 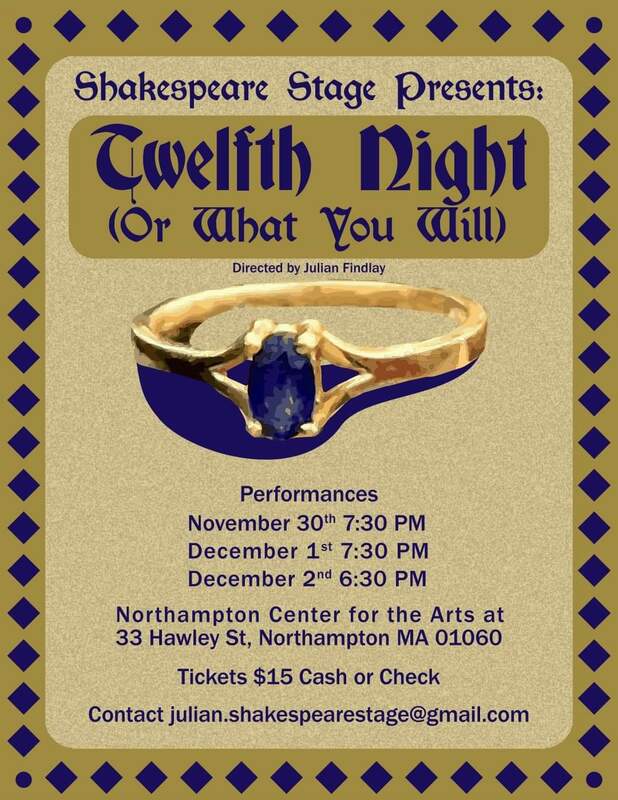 A classic tale of love in all of its powerful forms, Twelfth Night shows us that love can be lost, and found, in the most unexpected and unintended places. Join us for a cozy post-holiday weekend and laugh until your sides hurt as the ensemble gets into some hilarious hijinks. Tickets are $15, available in advance at www.nohoarts.org and at the door. Reservations are recommended. Live music by local musician Chris Devine enhances the joy and laughter as love is discovered, plots are hatched, and a set of twins causes quite the mix up. With both new tunes, and some that you might know, music truly is the food of love—so join us as we play on! Shakespeare Stage strives to provide artistic enrichment in the Pioneer Valley and beyond. Through passionate performances, involvement from the community, and the pursuit of dramatic excellence, we contribute to the growing importance of the arts and theatre for our neighbors.